‘Addiction’ is a good word to describe Amanda’s love of kayaking. But she wasn’t always a kayaker. In fact, she didn’t kayak until she joined an adventure recreation program in college after inquiring on a whim while she was enrolled in a computer program. She fell in love instantly, and learned how to sea kayak and white-water kayak. She then spent six years guiding tours on the Bay of Fundy before guiding abroad for a year in Australia and New Zealand. While in Australia, Amanda took advantage of a white-water stadium to learn tricks in a safe environment. Now, back in New Brunswick, she can confidently tell others that she can do cartwheels, front flips, and paddle over waterfalls. Amanda took videos whenever she went out, but she also took video clips while she was admitted to the hospital with health challenges. Since Amanda is always examining the world from different angles anyways, making her video diary was simply a matter of taking videos in the process. One memorable video clip for Amanda was when she filmed a snail in time-lapse as it moved across the sand on a beach (see 0:55 in her video). She was on a camping trip on the island of Grand Manan and took a moment to look down at the sand during low tide. She noticed she could see a periwinkle moving very slowly. As she often does, Amanda kneeled down and looked for a unique perspective of the world around her. Brontë’s background brings a unique perspective to her role as a fisheries technician with the Peskotomuhkati First Nation. Hours spent with her great grandfather, a herring fisherman who lived on the island of Grand Manan, impressed on her a deep respect for the ocean. When she moved from Fredericton to the coast in 2017 for a science communications position with Fisheries and Oceans Canada, it felt like coming back home. Before long, Brontë was helping out in the lab and field at Fisheries and Oceans Canada. But when the Peskotomuhkati First Nation contacted her to tell her they were looking for a fisheries technician, Brontë was hesitant. She had a degree in psychology and sociology, and assumed this disqualified her from a position working in the field. With social sciences becoming increasingly important in fisheries, colleagues and mentors encouraged Brontë to continue doing what she loved. She applied for the job. As a fisheries technician, Brontë now works on fishery and environmental files for the Nation. She focuses on files within the Nation’s traditional territory, but also keeps an eye on important cases involving Indigenous rightsholders on a larger regional scale. When Brontë first started filming her video diary, she was temporarily living in Halifax while taking an ocean governance course. Her time in Halifax is documented in her video diary before transitioning to more rural scenes in New Brunswick. At first, Brontë filmed points of interest that were clearly related to water, like a river or ocean scene. Later, she tested her creativity and filmed scenes that might not seem water-related to viewers but that still connected her to water in a personal way. Sondra grew up in a small town in Alberta, but it didn’t stop her from falling in love with the mysterious and powerful ocean. She was fortunate to have many family vacations in coastal areas where she was always excited to experience the water in a new way. She satisfied her growing curiosities in many ways: interning at an international marine conservation organization in Northern Madagascar; pursuing her divemaster in Mozambique; leading citizen science efforts in the British Virgin Islands, etc. Since 2015, Sondra has been enrolled in a PhD program in Social and Ecological Sustainability, conducting research on practical ways to achieve integrated management of coastal and marine social and ecological systems. 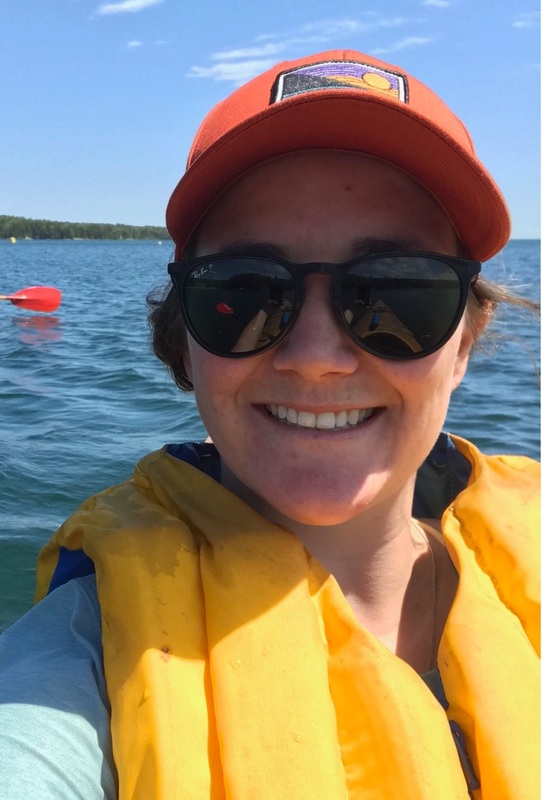 During the summer of 2018, Sondra was based at the Huntsman Marine Science Centre as a visiting fellow. She spent the summer travelling around coastal areas of the Bay of Fundy in New Brunswick and Nova Scotia, while fitting conferences and other commitments in between. One of her primary tasks was to interview coastal stakeholders around the bay, and she met many diverse people and ecosystems along the way. She reflects on how much she loved seeing people’s expressions as they talked about the things they loved. Sondra felt that this experience solidified and renewed her commitment to conserving the marine environment and sparked her interest in the role of coastal communities in doing so. Sondra aimed to capture diverse moments in her video diary: artistic, teachable, peaceful, scenic, exciting. About ¾ of her video was taken intentionally for the diary. These moments made her reflect on what stood out and helped her dig into many ways of looking at the bay. Because she has to keep the identity of her research participants confidential, she wasn’t able to show many people’s faces in her video clips. One of her favourite memories was whale-watching with her mom off the island of Grand Manan on a boat packed with about 30 children. They saw finback whales through the fog. Sharing this moment with her mom and knowing that others were learning about respecting the ocean were among the highlights of her summer. Sheena is a businesswoman involved in many aspects of fisheries on Deer Island, New Brunswick. She works as a lobster buyer for her family business and recently opened a storefront called the Boatique in partnership with her sister to service local fishermen on the island. From a young age, Sheena had the opportunity to be out on the water with her father, who was a fisherman. She adds context, “There are pictures of me in my dad’s new boat at three weeks [old].” Sheena credits her father for encouraging her to be a woman on the water, which wasn’t always common, and explains that one of her favourite things to do when she was young was to take a day off school in the spring to go lobster fishing with him. Sheena’s video diary helped her take moments to reflect on how blessed she feels. It helped her stand back, be present, and recognize some of the things that take place every day in her life that are quite amazing. She was surprised by how much she was able to capture in just one second each day. The saltwater is in KatieAnne’s blood. The Bay of Fundy has always been a part of her and her family’s life, so it was no surprise she studied marine biology in university. While spending a semester studying in St. Andrews, New Brunswick, she fell in love with the Huntsman Marine Science Centre, St. Andrews, and the slow life of the region. This led KatieAnne to work a position at the Huntsman as a lab technician identifying marine creatures and then ultimately as a full-time aquarist in 2017. She is always busy caring for the animals and maintaining and cleaning all the systems. But she enjoys seeing ‘aha’ moments in people when they visit the aquarium and see for themselves the diversity that lives in the Bay of Fundy. Most of KatieAnne’s video diary was taken at the aquarium, giving viewers a great snapshot of different animals that live in the Bay of Fundy as well as some behind-the-scenes perspectives. One of her favourite captured moments was the day she went out on a boat to catch pollock. This isn’t a regular occurrence for her, and she got to spend a half-day on a boat near White Horse Island in the Bay of Fundy.